Do the words in red bold give you a heartfelt concern? They should! 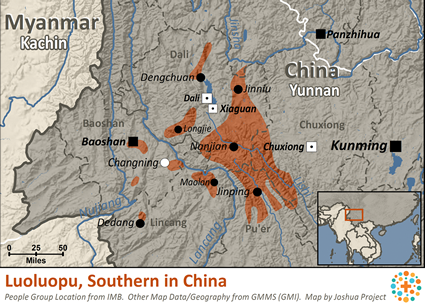 Luoluopo is the name of the three groups that stem from the Yi linguistic group. These three Luoluopo groups have distinctly different languages. Polytheistic animism is the main religion of the Western Luoluopo. Ancestor worship is also prevalent. Two or three ancestral rites are performed every year in honor of the Luoluopo forefathers. Most Western Luoluopo have never heard of Christ. There are few if any resources available in the language of the Western Luoluopo, resources such as Scripture and recordings. Pray for resources to be created and distributed. Perhaps Chinese believers will be led to take the Gospel of Christ to the Western Luoluopo. Pray that any ethnic barriers will be overcome. There are a few reported followers of Christ among the Western Luoluopo. Pray for them. Pray they will have good teachers and pastors sent to help them mature. Pray they will present a consistently faithful witness for Christ to their own people. 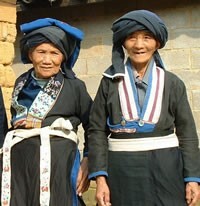 Pray the Western Luoluopo community will hunger to find a Savior for their sin. Pray they will be proactive in searching for Christ, and for this search to yield fruit. Pray for workers to take the good news to them.